2019 will see the release of 230 new emojis including the waffle, the sloth and the wheelchair, growing the number of the popular pictograms to 3,019. 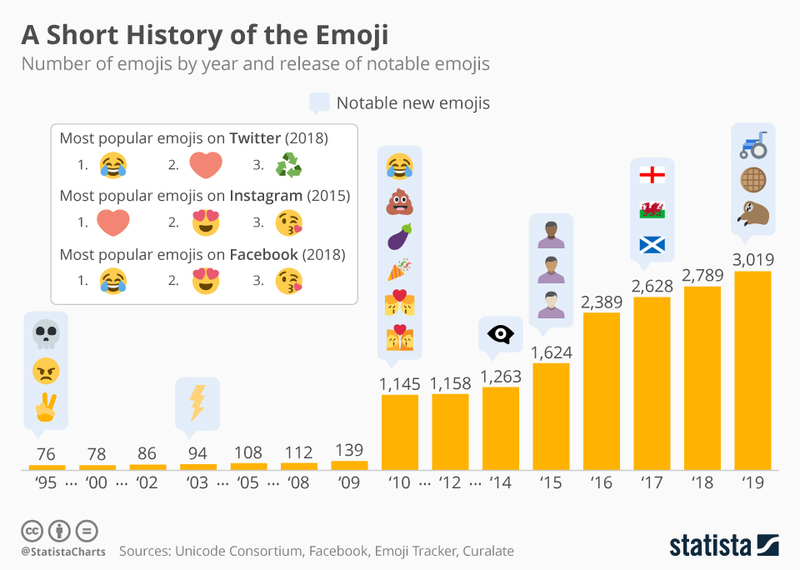 What emojis appear on people’s phones and on their social media platforms is not arbitrary but has been coordinated by the Unicode Consortium since 1995, when the first 76 pictograms were adapted by U.S. nonprofit. The Consortium has been overseeing the character inventory of electronic text processing since 1991 and sets a standard for symbols, characters in different scripts and – last but not least – emojis, which are encoded uniformly across different platforms even though styles may vary between providers. Read the rest at Statista.